A local grocery store recently started stocking high-end gelati and sorbettos. I tried a chocolate flavor a while ago, but I didn't blog about it. Now I have pistachio. Firstly, what is gelato? This is highly debatable, but I like to think of it as the supreme being in the ice cream world (or my Italian roots could just be biased...). Made with whole milk, sometimes cream, sugar and flavorings, it technically can't be as rich as frozen custard (which has cream and egg yolks), as the butterfat content of gelato ranges anywhere from 3- to 8%, whereas ice cream typically contains 10- to 18% butterfat. Of course, additional ingredients will increase the fat content in gelato. What really separates gelato from ice cream (unless it truly is high-end ice cream), gelato has less air whipped in, resulting in a consistency denser than ice cream and with a fuller flavor. I actually have a gelato and a sorbetto, which is a nice contrast between one and another. This is Talenti, pistachio-flavored, and I figured it would have to be somewhat decent because it wasn't colored a strange shade of green, but had a slightly green, mostly yellowish hue. 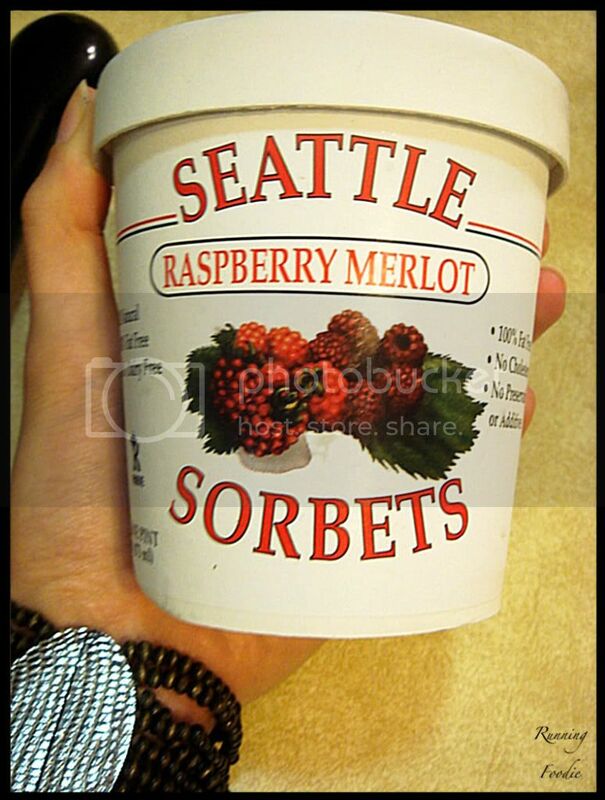 The next is a brand called Seattle Sorbets. Talenti has sorbettos, too, but this flavor, Raspberry Merlot, sounded really good. 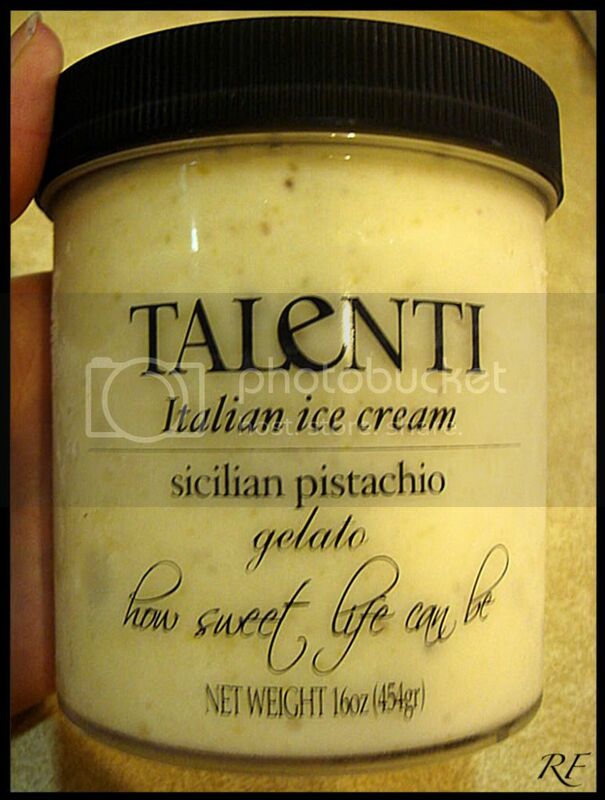 My first thought when I tasted the pistachio gelato was, "Nutmeg?" Which then made me thing of egg nog. There was a nuttiness, and there was a decent amount of whole pistachios, so overall it was pretty good if not the best pistachio flavor ever. The texture was denser than ice cream, but I'm not experienced with gelato so I don't know how dense it's supposed to be. (I have an idea in my head, but that may just be me.) The next day, after it had been in the freezer overnight, it had a little ice crystal thing going on, but just slightly. I don't think it was like that the first day, but I can't remember. The level of sweetness was interesting, as at first it almost seemed to be too sweet, but it never got quite to that level. I like it. The sorbetto was really good. The texture was smooth, and I appreciate that it was strained of seeds. 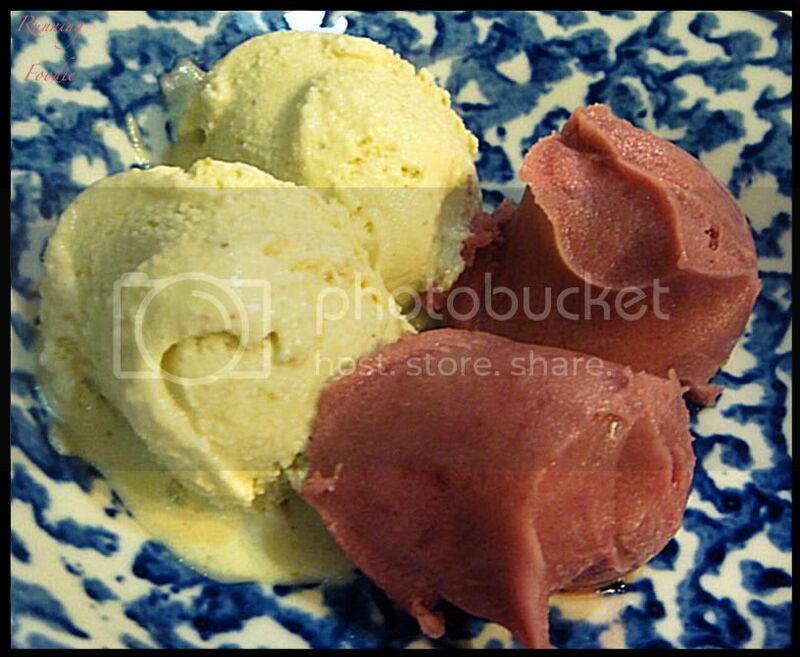 (I don't think I've seen any raspberry gelato/ice cream/sorbetto that has seeds, though.) The flavor was existent, not fake in any way, and there was a slight yeastiness from the wine, but overall it melded well and added a depth to the raspberry. Both of these are definitely worth it, and I really like that the gelato comes in a reusable glass container with a screw-on top. Call me insane, but I almost liked that more than the gelato itself! I also have never had a gelato. If I go into Little Italy this weekend, I'm going to make a mental note of it. Good choice with the pistachio flavor. You ever find it weird that like fake pistachio flavor tastes nothing like the nut? And honestly, it even tastes better. I love gelato, I got to try the real thing when I was in Florence a few years ago, so much better than regular ice cream I just wish I could buy it over here. VeggieGirl - I find sorbetto to be more cooling than gelato or ice cream, probably because the two latter are more sticky due to the milk. Sorbetto has a deeper flavor, too. Adam - It's been a long time since I've had pistachio anything, besides actual pistachio nuts, so I can't attest to that. The strange shade of green usually turns me off before I taste it! Ben - Fun times! I froze a batch of strawberry pastry cream I made, sans ice cream machine. It's pretty hard and a little icy, but it tastes good! Sam - It's a dream of mine to go on a gelato tour in Italy! It's a bummer that you can't find any where you live.